The rotisserie assembly substitutes a cage grill. 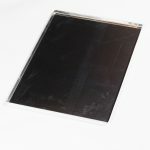 It contains one spit having a square section (6 mm side) and a useful length of 54 cm. 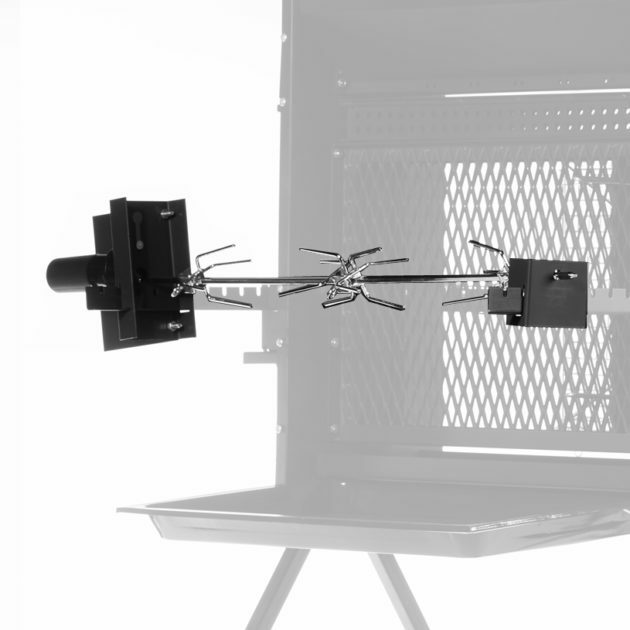 Two devices that slip out into the cage grill support racks hold the rotisserie in place. 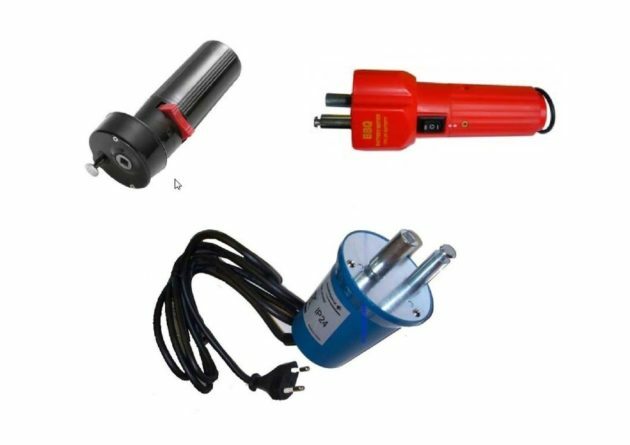 The holding devices are designed so as to accept most of the motors (battery or electrical network driven) available on the market (see photo here below on the right for some examples). 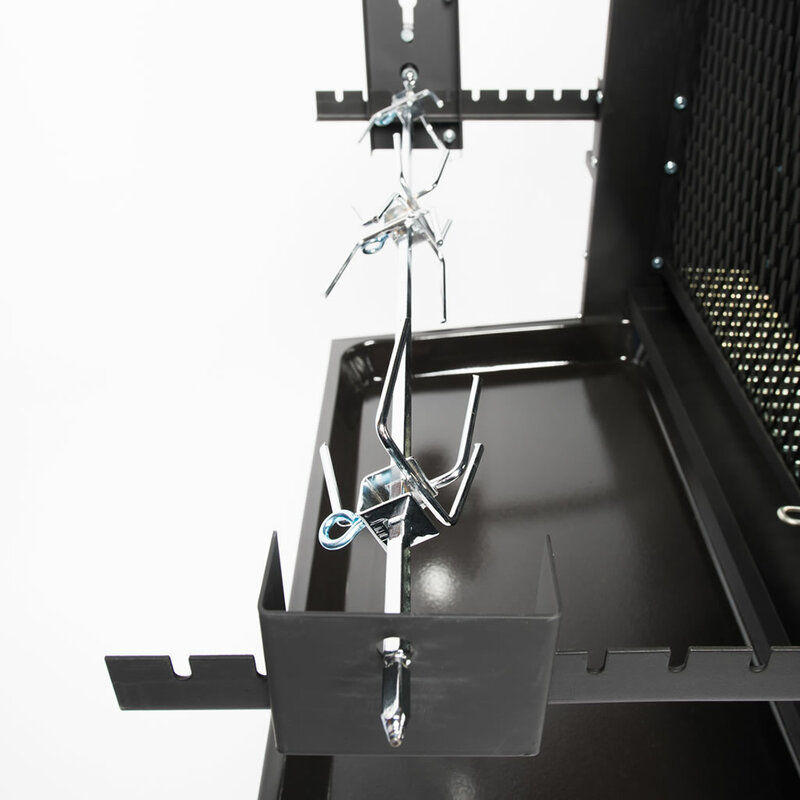 The standard cage grills allow grilling food having thicknesses ranging from 10 to 30 mm. For larger thicknesses, lid grids provided with the standard cage grills can be replaced by height extended lid grids (15 mm extension). This increases the maximal thickness up to 45 mm (typical for regular T-bone steaks). One dividing partition set is provided with the barbecue. A second dividing partition set can be purchased optionally. 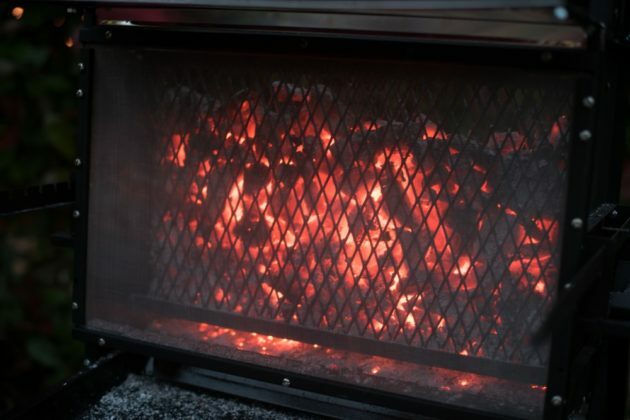 Combined with the dividing partition set provided with the barbecue, the second dividing partition set allows the reduction of the “glowing ember wall” to 1/4, 1/3, 1/2 or 2/3 of the total capacity of the firebox in a central position. When the cooking phase is over, the food must be taken out of the cage grills (“demolding” of the cage grills). The most efficient way of doing this is to turn the cage grill over a big tray after having removed the lid grids (and the spring cotter pins). Knocking gently the cage grill on the tray is usually sufficient to release the food from the cage grill and allows collecting it in the tray. 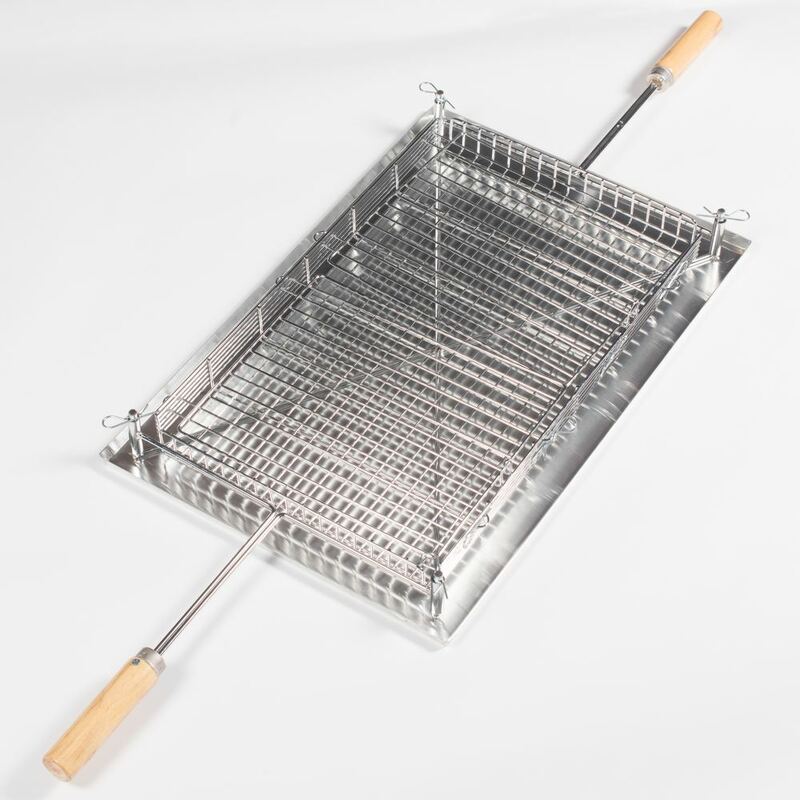 This tray which is slightly larger than the cage grill is very practical for such use. 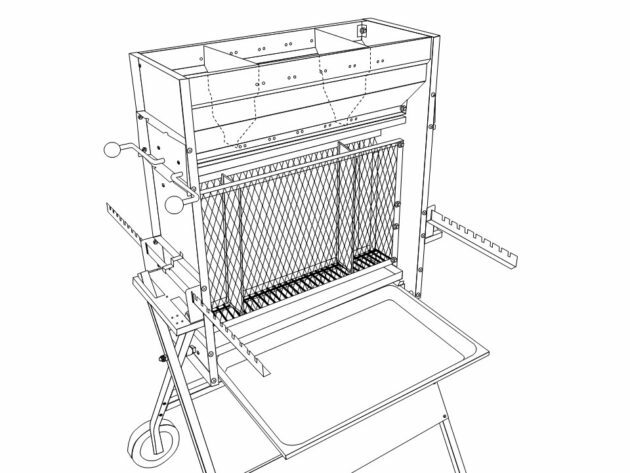 The “demolding” of the cage grill can thus be made directly into the tray without spreading fat all around…. In the event of windy conditions, flying ashes produced in the firebox may be blown on to the food being grilled. Although this is not intrinsically dangerous for heath, it may not be attractive from an esthetic and/or gastronomic point of view. Two solutions are proposed to address such difficulty if it occurs. 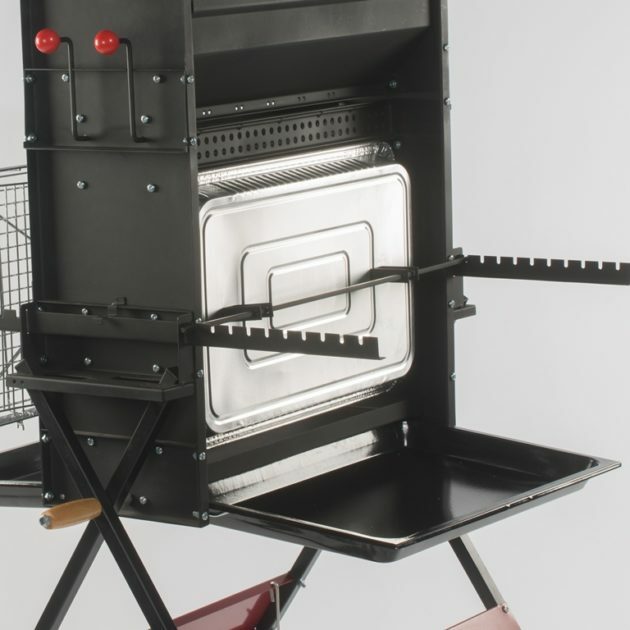 A disposable aluminum pan can be placed vertically against the firebox to close one of its two sides. Air draughts are thus reduced. The shiny surface of the tray reflects the infra-red radiations to the opposite side. 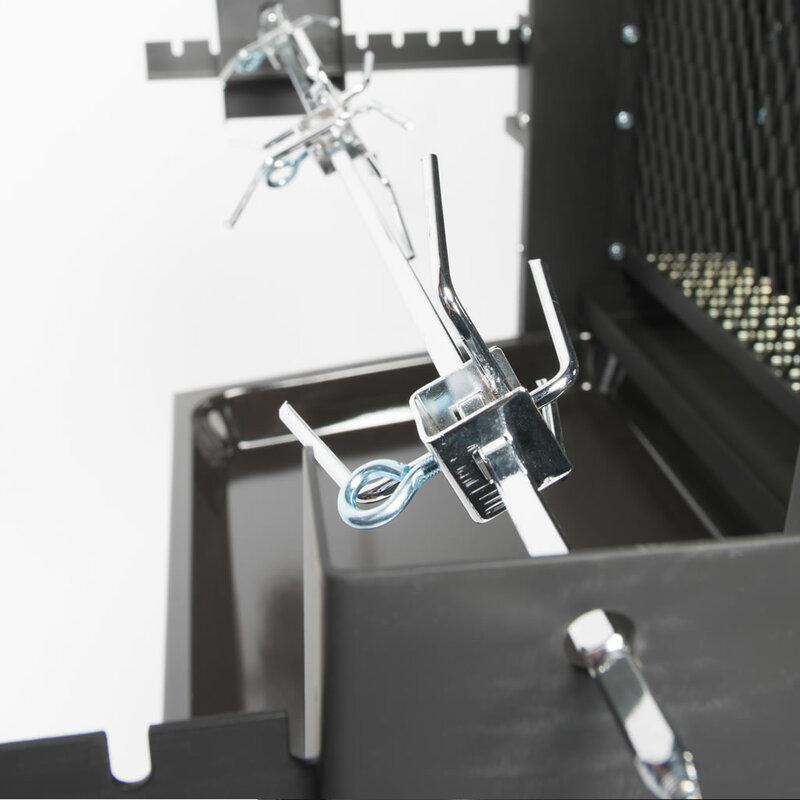 The pan is held in position with two locking wedges mounted on a rod that fits into the grooves of the cage grill support racks. The locking wedge set can be purchased separately or in the form of a pack with 4 aluminum pans. Aluminum pans can also be purchased separately in a pack of 12 pieces. A fire shield can be mounted optionally on all barbecue models. Two hangers must first be mounted on the sides of the barbecue frame for such purpose. A carbon steel frame supporting a thin wire cloth made of stainless steel. Its role is to prevent flying ashes from being blown away out of the firebox by horizontal air draughts. A horizontal stainless steel plate. Its role is to prevent possible flying ashes caused by ascending convection air streams from falling down on the food being grilled. The fire shield fits on the two hangers previously mounted on the barbecue frame, parallel to the vertical firebox, between it and the food being grilled. The fire shield can very easily be added to or removed from the barbecue without using any tool. Such addition or removal can however only be done when the barbecue is not in use (cold). The fire shield, barely visible here below, is nevertheless present.